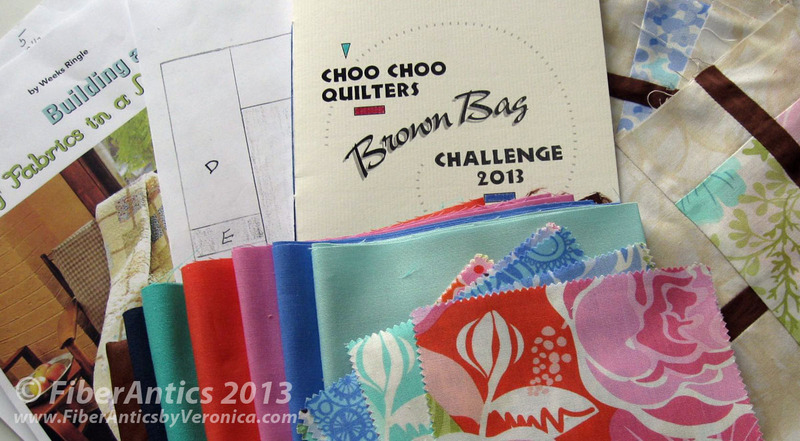 The second rotation of the Brown Bag Challenge was from mid-April to mid-May. As each month passes, the "surprise inside" each bag will get more interesting. I'll get to see how the quilters in the previous rotations are inspired by the bag's contents, how they interpret the guidelines, and what they have contributed to the project. Here is what I found in Brown Bag #2... packages of charm (5 inch) squares, several solids and blocks from the previous contributor. What's inside the Brown Bag? The first contributor drew a sketch for a block design and added an article for inspiration. The floral inspired prints, the cheery colors of the solids, and the guidelines of the owner to "add, subtract, multiply or divide" inspired me to revisit the inset strips piecing techniques we discussed in our Choo Choo Quilters Inspirational Quilting program on innovative piecing. Innovative piecing—my contribution to this Brown Bag. 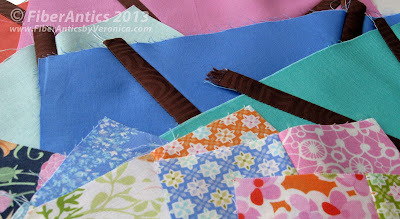 I am really enjoying this round robin guild project.